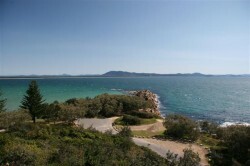 We extended our stay at Trial Bay for another couple of days, too good to leave in perfect weather (21 degrees). Our camp site is in the photo below. 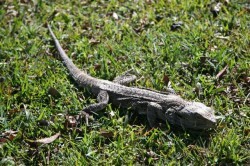 Visited the gaol ruins today and on the way spotted a Lace Monitor, also enjoying the sun. The gaol was interesting, it was built in 1876-1883 to rehabilitate prisoners by teaching skills as they built a breakwater. It was the only gaol ever built in Australia for a public works project. This breakwater was meant to be 15oo m long, but it got to only 500 m before half of it was washed away in a storm in 1899. In 1903, 200 m of breakwater was again washed away so they stopped the works and closed the gaol. By this time the breakwater was not needed anyway as ships were larger and didn’t need a sheltering spot between Brisbane and Sydney. The photo below shows what is left of the breakwater (taken from one of the guard turrets in the gaol). Not much to show for 20 years work! The gaol was also used for an internment camp in 1915-1918 for German citizens. 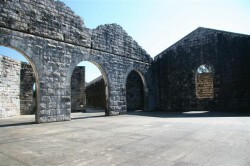 The gaol is an impressive structure made from local granite, which was also used for the breakwater. It was extremely hard stone, which is one reason for the slow building progress. Tomorrow we head off to Iluka for a few days before we head into Ballina for repairs. 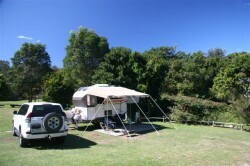 The caravan park is on the banks of the Clarence River so we should be able to fish from our camp site. We have just brought a damaged 2008 KK in W.A. and hope to fix it and travel like yourselves. Did not know before hand thou….of the probs etc.. that have happened during your trips. May not have brought it??? Any points to note of and warranty ref. kind regards Margie &amp; Pete Grass. 23 Allard St, Traralgon, Vic. 3844.